Fearless reader Russian Imperial Karl passed this article on to Magnus Skullsplitter who graciously shared with the rest of the crew. *Incidentally, reader True Brew Baloo sent us a link to this Time magazine article which claims that heavy “binge” drinkers actually live longer than non-drinkers. I’m not gonna lie to you…that revelation was a wee bit surprising. But even the Aleheads were surprised at how far back the health benefits of beer were being exploited. 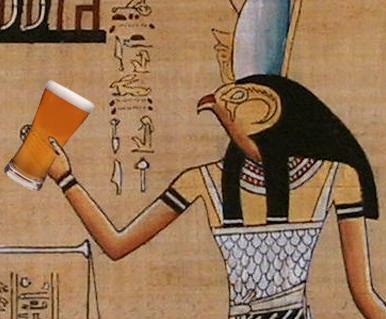 The ancient Nubians were perhaps intentionally brewing beer laced with antibiotics as far back as 1,500 years ago! Keep in mind that the first modern antibiotic, Penicillin, was “discovered” in 1928. Researchers examining the bones of Nubians found traces of tetracycline, a powerful antibiotic, in doses too high to have been accidental. And the only way they could have regularly produced and consumed the drug? Through brewing and drinking beer, of course! Most telling of all, a leg-bone and the skull of a 4-year-old were full of tetracycline which lead researchers to hypothesize that the boy was intentionally given high doses of the antibiotic (probably through beer) to cure him of some illness. So there you have it. It tastes great. It looks great. And it cures diseases in children. Beer…is there anything it can’t do? Posted in Brews in the News.Tagged Antibiotics, Beer, Nubians, Tetracycline.